Coming to theatres from directors Christian Tureaud and David Salzberg is the intense and equally amazing story that can be found in THE HORNET’S NEST. This film tells the story on several fronts. First, Mike Boettcher who is a 30 plus year veteran and Peabody and Emmy award winning journalist is embedded with U.S. Army’s 101st Airborne Division deep in Afghanistan. Joined by his young son Carlos, these to men follow the troops into battle capturing on film the truth of war. The draw of this film is the relationship between Mike and his son Carlos but also the relationship these two men have with the troops they are living with. From the courageous men who look out for one another to the all-women Medivac team who care for the wounded, THE HORNET’S NEST is an eye opening experience of what happens in combat and, sometimes, a heavy weight on the hearts of the families waiting back home. Director Christian Tureaud has spent a great deal of time working within the entertainment business. 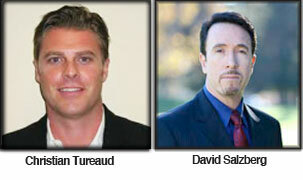 David Salzberg is a producer whose career has included development, production and distribution. Both of these gentlemen have produced such films as THE PERFECT GAME and the documentaries RUNNING WITH SAHARA and FOR RIGHT OR WRONG. I was thrilled to have the opportunity to speak to them both about the film, how it came together and, of course, how this project has changed them personally. Thanks for joining me gentlemen! I’m very honored that you both took the call today. I have to tell you that the first five minutes of the film I didn’t know what to expect. Christian: That’s a good thing. Christian: Actually, we were asked to make this movie by Mike, Carlos Boettcher and folks involved with them. It’s a long story. We were asked to make the film and initially we said no because we were working on another project. Then we got on a satellite phone with Mike, he called from Afghanistan at night when all the guys were sleeping and he told us more about his relationship with the military and what it meant and what it could mean to the country. We immediately came in saying absolutely. Then Carlos flew back from Afghanistan with 500 hours on hard drives and footage from the front lines. Once we started looking through the footage we realized we had something very, very special here with an arduous task to take 500 hours of footage and make a 90-minute film that had a story. We were just really excited to do it and extremely humbled by the outcome. How long did it take you to go through all that footage? Christian: To this point it has taken about three years and we just finished the final film a few weeks ago and that’s for a number or reasons. One, we wanted to work with the folks, the units and the Gold Star families that are actually in the film. We chose to work with them as our focus groups rather than a traditional Hollywood Nielsen rating were you go in with a group of people and have them rate it good or bad. We decided to take it the people in it and the people who will most benefit from it. It’s a very candid crowd by the way, if they don’t like something they will tell you right up front. If they like something they give us more acknowledgement than you probably deserve. They are so grateful to have a non political film that shows a view of their world. I noticed that there weren’t any politics involved in this. Christian: That was a conscious choice David and I made early on. There were two things, we felt if we could keep it non-political we had an opportunity to bring the country together because we like to say the ‘right has never been more right and the left has never been so left’ but this isn’t about politics. This is about being American and if we can bring the country together that would be an amazing tool. Secondly, the father-son, keeping it father-son and telling it through there eyes. There has been a plethora of war films made over the years, there is a bunch of Afghan and Iraq war films being made and distributed but none of them have ever been told through a father and sons eyes. We felt that would make this film special. Do you think that was the selling point for you mainly to take the project? David: Actually Mike and Carlos didn’t want it to be about them. They were adamant at the beginning with Mike and his 30 plus years in journalism didn’t want it to be about him but about who he was covering. He wanted it to be about the soldiers and Marines and we fought him. What ended up happening was Carlos brought the footage back and Mike was still in Afghanistan and then Carlos went back. It gave us a chance without them around to start making the movie and have them in it. Only until we had the first cut did Mike even see it and then he said ‘I get it! Telling it through our lens only makes it more powerful’. Mike was able to understand from a story prospective what we were trying to accomplish. The scene where Carlos is up on the hill and all of a sudden there is the craziness, how hard was it for you to watch things just like that in 500 hours of footage? Christian: Obviously its difficult to watch people in great danger, especially when you know its 100% real. We did know Carlos survived that mission but because of the footage we have and because some of its very graphic in nature, we chose to use storytelling rather than carnage to tell the story. We appreciate that you noticed Mikes scare because we found Mike’s perspective directly tied back into every family from the point of view of pride but also the point of not knowing! He found out that his son made it but many of the families get a call not knowing what’s going on. We felt the audience could really relate to Mike’s concern in the moment at the same time knowing they worry about their own family members for a longer period of time. Did the families involved in the film help choose what you would and would not use? Christian: Yes, we got a huge white board out and started putting a list of the Sgt. Majors, Captains and cross referencing the battles. This gave us a framework to work from and then went in with our team, not just but our team of people who are award-winning editors in graphics and music and they have worked with us this whole time. It gave us a point of reference as to what we were working with, what missions they were going on and which ones we would focus on. The end of the film, the third act is something no one has seen before so clearly that had to be in the film because it felt to the audience that it’s a scripted feature film because we had so many cameras covering to many angles that it made it so powerful. How did you manage to get clearance to use the military footage? David: Because Mike Boettcher is a 30 year award winning journalist and is known and stands for being neutral and letting the story play out, he had significant connections to the joint chiefs and in a time frame when all the major networks had stopped imbedding because of the danger. Twenty-three journalists have been killed in Afghanistan since the beginning of the war. Mike got special permission from General Campbell’s office who allowed him to go to the bases and be with these folks. Most of the units that are in the film — the 201st Airborne and 28 Marine Units —are very decorated and out front unit. You have got to be accepted by the officers and the non-commission officers and tell the appropriate stories about them. In fact they take great pride in throwing journalists off the base if they don’t do them justice. Realizing Mike had more war experience than many soldiers they accepted him. His legacy, his history gave us unprecedented access that no one has had I believe in the whole war. Most imbedded journalists are at the base and go on some walkouts going a day or two. Mike and Carlos were imbedded on the front line for a year at a time. It also gave them a different level of acceptance because if someone is living right with you in the foxhole and right there with you, you are going to accept them in a different way than someone who comes in and out of your life like 72 hours or a week at a time. 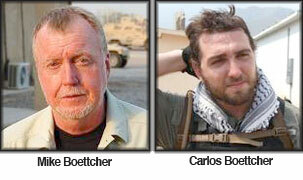 The guys knew they could count on Mike and Carlos to tell a fair story and to not get killed. When you were watching this footage of father and son together, personally how did you feel about that because it scared me? Christian: David and I both lost our Dad’s early on in our lives so the father/son story line is very important to us. We’ve used it in storytelling in previous films and that’s why we were adamant with Mike and Carlos. If we were able to use them as part of the story it could make the film special because no one had done it before. We all know the father/son relationship within stories brings another family dynamic to the story telling. That was why we were so adamant to have it be about them. Once we started seeing the footage of what we had to work with from a story telling perspective it got kind of exciting because when we were able to create a parallel between the two story lines. There is A) The father and son and B) the soldiers and Marines and there is a parallel between these two, a thread where they both do what they do because no one else will do it. They believe it’s there duty to do this for the country and hopefully that comes through in the storytelling. David: The thing we found is Mike and Carlos specifically Mike and the soldiers and Marines and those who go into danger have the same kind of background. The guys say I’m going back because no one can take care of the guys except me. When I say guys I mean men and women because we have an incredible all-female medivac team in the film. They all say the same thing – I’m just trying to help, I’m just trying to make a difference and no one else will do the job so I’m going to do it. That connection between Mike and Carlos we were blown away because the ones who connected with these two are the Moms and wives of those in the military. We didn’t know that the families, the support mechanics, the Moms and wives drive this world. You don’t think that they would but they do. They stay at home, take care of the families, worried about the guys and the gals, but for the most part, the heart and soul is the Moms and wives. The way they’ve connected with the father-son has just blown Christian and me away. Christian: Because most war films, women don’t connect to war films. That was a unique thing we found with this film. Women really, really love it. Wives and moms, sisters and such has been really cool for us travelling around and done these screenings with the reactions we’ve been getting has been overwhelming positive and it’s come from women. We are really excited about that. There were moments in the film when the young men were talking and I actually went back to that scary place when my son was in Iraq for all those years. I didn’t like that feeling then and I don’t like it now which means the film did its job emotionally. David: Early on we screened for one of the Delta Force guys, his name is Dale Comstock and he is patriotic and he’s very out in front and he said exactly what you just said. He said, “It took me to a deep dark place and I didn’t know I wanted to go there again. It scared me and made me angry but also created a sense of pride and relief about what it is I’ve done”. If you are a Delta Force or a Seal, these guys are out front. It’s funny, Christian and I asked if this is the greatest war film every made or the greatest peace film ever made. These people want to be with their families, graduations, weddings etc., we all do but they chose this incredible honorable life as Americans and they are out on the front line. They don’t say ‘hey, I only want to go to Hawaii’, no, they go where they are sent and do their job. How close do you feel like you got to some of these families from the film? Christian: That was the first thing we did when the film wasn’t even done. When we say it took three years to make this, it truly took three years. We started screening it a year ago but that version had continued to evolve all the way up to two weeks ago. The reason is we went to the families right away and the three commanding officers in the film and we showed them a very rough cut. They said ‘we will support you if you go to our Gold Star families and our Wounded Warriors because we believe this film thing will help them heal and give them support and give them closure.’ So we did, we went to every single Gold Star family to every Wounded Warrior and every soldier and Marine. David got hung up on many, many times because they didn’t want to talk to us. They thought we were just another Hollywood crew coming to tell their story and not follow through because it’s happened many, many times. Since that time we have all become this family, become this community and its become a bonding experience that is unbelievable. We have helped each other through this process and gained insight. We helped them with different issues they might have had mentally coping with things, we’ve gotten two Gold Star widows mortgage free homes for life to start their lives over by introducing them to charities that give these home away. We have helped so many different soldiers and Marines that aren’t even in the movie that have come to us through this process and movement that’s taken place. It’s been amazing for us. It’s not just soldiers and Marines from this film but other wars as well. We’ve had them come to the screenings and when a 92 year-old comes to you in a bombardier jacket and says, ‘thank you son for what you are doing’ that’s pretty amazing. How did you get Wynona Judd and Cactus Moser to get involved doing the music for the film? David: Christian and I have learned over the years that it always pays to be nice to people because you never know how God will direct you to being open and receptive. Christian was working out of his gym and a man came in on crutches without a leg and he assumed automatically that he’s a war veteran. We deal with soldiers who have missing limbs. Christian starts talking to him and says no he’s not a veteran but lost his leg in a motorcycle accident in Sturgis. He says he’s there because his wife is taping ‘Dancing with the Stars’. Christian says ‘who’s your wife?’ and he says Wynona Judd, the man was her husband Cactus Moser. These two hit it off and became friends. The next day Cactus saw the movie, and then saw it again and they ran with it. They have become family. Wynona and Cactus are passionate about troops and giving back. It made a big difference and they wouldn’t be in it if it wasn’t real. Wynona took the torch from Bob Hope and Cactus has a heart of gold. Christian: Cactus and Wynona started a charity for prosthetics for soldier and Marines and troops coming home that can’t afford to get one otherwise. They perform for free to raise money for the troops so they can get what they need to start their new lives. They are amazing people and they have been such supporters of the film. David: They are an example of the family that has grown coming out of this film. The song is hauntingly beautiful. Christian: That’s great, thank you for saying that. I have to tell you that they are a comedy act. If you get a chance to see the new act Wynona and the Big Noise and Cactus is her drummer. They are like a modern day Sonny and Cher. She is so funny! How did this film change you personally? Christian: This is a very unique film, a ground breaking feature film using real footage. If you’ve seen a lot of documentaries this is like nothing that’s been done. It’s not a bunch of talking heads showing you long ago footage telling you a politically package story. This is an immersive experience that doesn’t have actors. These are the choices we have made to show it as an experience. For me personally, I didn’t have any military connections in my immediate family so I grew up a real civilian disconnected from the military. This has completely changed my views, perceptions and my life. The commitment we have to celebrate these men and women with their heroism and bravery that they display is awe-inspiring. We talk about it when we do these Q/A’s on stage. It’s truly change my perception and I’m humbled by what they do day in and day out. They don’t ask for anything, they don’t want the spotlight or the medals; they just want the country to know what they are doing. When someone comes up and says ‘thank you for your service’ now they know what they are thanking them for. David: My perspective is the same. I did serve in the military and I come from a family that I won’t say a heritage but my father, grandfather and great grandfather served. I’ll tell you that meeting the people, and I was not a combat veteran but Air Force, but meeting them and spending time being welcomed into the family – the infantry family, guys on the ground at the pointy end of the spear and the unimaginable pride that they all take in serving our country profoundly changed me as a person. Just seeing the look on my father-in-laws face as he watched the films a couple of months ago, is from Vietnam and lost his country, the look on his face of pride and joy and also profound sadness because you could tell he was remembering. I don’t know how it couldn’t change you. If you have a heart and soul working on something like this wouldn’t change you. Christian and I have had both Hollywood careers and Independent careers and traditional careers and friends said if you’ve done this job long enough you’ll find a story that is way more important than the movie. They said don’t be a dummy, realize that you have something way beyond you. These kids in our military do things way beyond them and it really hit home. What do you say to someone that’s lost a father or husband, or someone who doesn’t have limbs or burnt so bad that they have every reason to be sad and they tell you that they love you, or God bless you – how could you not be inspired to go beyond yourself. The folks in the film affected us that way. The folks that are in the film and the stories that they tell are so heroic and selfless about how they lives their lives and its humbling. Just so you know you are now a member of all military families. Christian: Here’s the thing, creating a Facebook that is a safe haven has grown and grown. It’s all organic and we haven’t spent one dime on it and we’ve gone across the country and met different people. Families have basically endorsed us if you will and their friends and family have come. Veterans of all wars have built a community that get’s bigger and bigger so go to Facebook and be part of our family. It’s a movement to bring our country together. FINAL WORD: That’s an amazing way to end this interview with a film and people who want to bring our country together. These resolve of the soldiers is nothing shore of stellar and their strength is unbelievable. Listening to them tell their stories bring the message even clearer that we must take care of each and every one who serves. It is always a struggle to watch films such as this because I understand the strength, resolve and worry families have at home. Every time my son Jason had to return to Iraq during that war I’d paint on a face of strength but inside I would constantly worry. No one understands that more than the connection of these military families. Their surroundings are hostile yet their mission is clear as these soldiers and Marine do what is necessary to help not only the Afghan people but also each other. These are the stories that need to be told. Mike and his son Carlos bond during this time with a mission of their own. To capture and bring to light what is going on in what most people would say is “a world away.” These two men put themselves in harms way to bring the stories of these soldiers and the risks they take each day. Watching their relationship grow is not just heartwarming but, at moments, heart stopping! For more in-depth information on THE HORNET’S NEST I urge you to go to www.thehornetsnestmovie.com and join the mission on Facebook at www.facebook.com/TheHornetsNestMovie. Our thanks to Christian and David for their candor and their unprecedented look at those who serve. THE HORNET’S NEST is coming to theatres so take time to see this amazing film. In the end – this is not based on a true story, this is a true story — a real war and these are real heroes!